SAN FRANCISCO — Wednesday, October 31, 2018 — Trifacta, the global leader in data preparation, today announced its position as a Leader in The Forrester Wave™: Data Preparation Solutions, Q4 2018. For the report, Forrester evaluated Trifacta among 10 of the most significant data preparation solutions against 18 criteria, grouped into categories of Current Offering, Strategy and Market Presence. Of the 18 evaluation criteria, Trifacta received the highest possible scores in 14. In the Current Offering category, Trifacta received the highest possible score in the data criterion—which is comprised of the subcriteria of data types and data profiling, transformation, and blending. It also received the highest possible score in the machine learning, UX by user role, satisfaction with ease of use, team collaboration features, and security and governance criteria. In the Strategy category, Trifacta received the highest possible marks for the planned enhancements criterion, as well as for the professional services criterion. Trifacta also received the highest possible score in the Market Presence category for the growth and global breadth criteria. Finally, Trifacta received the highest possible score in the number of customers criterion. To download the complete report, visit Trifacta’s website. 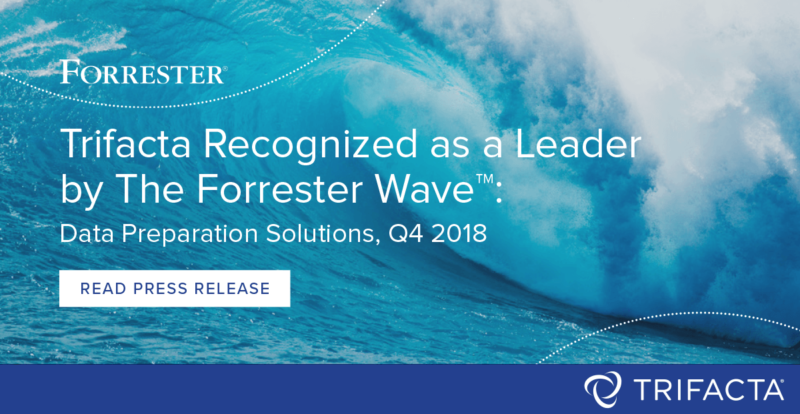 The second Forrester Wave covering data preparation arrives at a time of huge growth and momentum in the category, with companies increasingly focused on not only adopting data preparation platforms, but also hardening the workflows and processes already in place. It’s this shift that has driven a 3x increase in customer count year over year for Trifacta in the past two years as it expands its global reach and traction within key data-intensive industries like financial services, healthcare and life sciences. According to the report: “Customer references can’t say enough about Trifacta’s ease of use, citing that ‘a beginner is typically using Trifacta after 2 to 3 hours of training,’ that the platform is ‘intuitive to use,’ and that it ‘profiles the data automatically and … enables us to identify outliers easily.’”1 Trifacta views this accolade as a key milestone recognizing its leadership position in the data preparation market, and its unique strengths as a provider solving the challenges of manual and code-based approaches to data preparation. This ranking as a leader from Forrester is the latest of many recognitions by leading technology analysts. Earlier this year, Trifacta was named No. 1 Data Preparation Technology in Ovum’s Decision Matrix for Self-Service Data Preparation. Prior to that, Dresner Advisory Services’ End User Data Preparation Survey ranked Trifacta the No. 1 data preparation vendor of 2018, the fourth year in a row. In the Gartner Research Market Guide for Data Preparation, Trifacta demonstrated support in all of the established capabilities for “Data Transformation, Blending and Modeling,” “Diverse Data Sources,” and “Data Exploration.” Trifacta is listed on Gartner Peer Insights and, as of October 2018, has 55 reviews with an average 4.7 out of 5 ranking. Trifacta continues to exhibit innovation and leadership in the data preparation market.